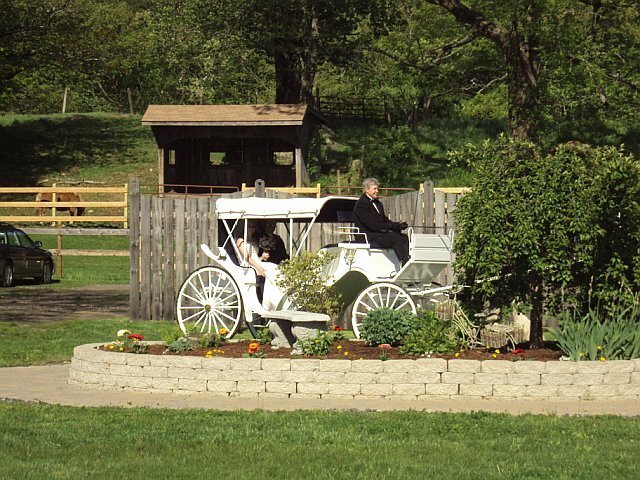 We had a fabulous, relaxed ceremony and reception at Wood Acres farm. We, and our guests, enjoyed every moment of the weekend. Any bride and groom looking for a unique alternative to a typical banquet hall should look here. You will not be disappointed! Very professional, prompt responses to all communication pre- and post-wedding, experienced, artistic, easy to work with, somewhat affordable comparatively, open to our ideas, took two hours to meet with us a few weeks before the wedding, personable, passionate about his work. Took just about every shot I had requested--looking back, there are some others that I wish I had requested but he did remember everything we had talked to him about (including specific areas where we wanted photos and "poses" we liked), which was impressive. Very friendly and somewhat accommodating but not great with the details. At least three of six tuxedos did not fit properly at time of pick up. They did fix the problems we had but it was a bit of a hassle. There was also an issue with a coupon we had. The person who took the order approved it but when my father-in-law went in to use it, was told he couldn't. The issue was resolved but again, it was a bit of a hassle. 5 stars, pending receipt of our video, which we haven't seen yet! Bill was great to work with. Very professional and accommodating. We booked him last minute and he gave us a good deal with some extras. His wife was the second videographer. I think she is just getting into it. They were very fun, easy to work with and happened to have gotten married at the same venue! Correspondence with Bill was easy and he was very prompt in getting back to me, answering questions, sending me a demo video, etc. They stayed until the very end of the night and even willingly came back in when my dad grabbed them on their way out to capture our last dance, with our guests circled around us. Delicious cake. Personable and helpful staff, particularly Carla. We stopped by one day just to check out their cakes and they offered us a tasting on the spot. The cake at our wedding was even more delicious and they decorated it exactly as we asked. My husband's parents also got their wedding cake from Modern Pastry 36 years ago! Beautiful classical guitar player. My dad is a musician and works with him. He is based out of Massachusetts but didn't mind travelling. Highly recommended. Very talented (sample recordings are on his website). Very personable manager, excellent service, help set everything up and take everything down. Extremely flexible and willing to accommodate. We had a buffet. It's not the fanciest (which is why I gave 4 instead of 5 stars) but it's also much more affordable than most. Many guests did say they thought the food was great. Based out of Easthampton, MA as ABC Productions. Friend of my dad's. Excellent. Great MC, read the crowd well, accommodated all of our requests, not too loud, large selection of music. Friendly, professional, experienced. Accommodating. We were flexible on flower type, as we were doing wildflower arrangements but the owner, Christine, was accommodating, knowledgeable and helpful. Poor communication,took much longer than initially told (despite me telling them that we were on a tight time line, as we had originally planned to print them at Office Depot). We provided blank invites we got at Target and they used about 15 to "set up the press", which left us with fewer than we needed. Would not recommend. We LOVE everything about Wood Acres. We looked at many venues and nothing compared. The setting is so serene and as soon as we met Joyce, the Director, we know we would be in good hands. We planned to have our reception outside, and the weather did cooperate at the last minute! Our backup plan was Barnes Chapel in Bristol, about 20 minutes away. They were very helpful and accommodating to our request, which was to reserve it but then to decide the day before whether or not to use it. We also had our reception dinner at Wood Acres, which was unique, relaxed and very fun. After rehearsal, we all had a 30 minute hayride, then had pizza (ordered by Wood Acres) and a bonfire! Everyone loved it. See Reception for more about Wood Acres. Again, we LOVED everything about Wood Acres, as did all of our guests. Many of them had never been to a wedding in that type of setting/venue before. We knew we didn't want a banquet hall. Joyce and Michelle, as well as all of their staff, we excellent from start to finish. I often send emails with questions and requests. They always responded quickly and were very willing to work with us. We just got a good feeling from the first time we visited and we could not have imagined having our wedding anywhere else. We felt comfortable and very well taken care of. We think it's a hidden gem because many people where we live have not heard of it--although it is very popular because when we booked it in October, there were only 2 Saturdays available between April and October! Excellent! Nice, clearn rooms--all are suites with kitchens and pull out couches. Great for guests who want to share a room with other guests. Matt Barger was quick to respond to my emails, accommodating of my requests, etc. He sent me updated lists of our guests so we could give them gift bags when they arrived. The hotel didn't mind handing them out and everyone got theirs without any issues. We also had a morning after brunch there, which was fabulous. They let us bring in our own food (from Panera, up the street) and the space was perfect. They provided coffee and tea and allowed us to hang out until everyone left. 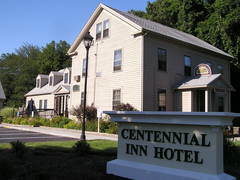 Would highly recommend this hotel (it's about 20 minutes from Wood Acres but is one of the closest and is very reasonably priced).